Despite being the recipient of constant scorn and scrutiny by her new country-clubber friends, Piper O’Donnell has what it takes to turn her town upside down. If only her husband hadn’t taken that supposedly "once in a lifetime job." Then she wouldn’t be stuck in a godforsaken place trying to fit into a social set that thinks pashminas are a type of camel and Kate Spade is some sort of a gardening expert. What she wouldn’t give for a mojito on the terrace of some posh New York City café watching the latest fashions strut by on 5th Avenue! 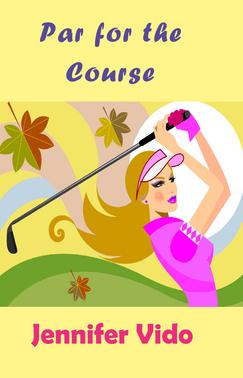 Nowadays, playing nicey-nice with the local "ladies who golf" is at the top of her list. Who said the score has to count anyway? Isn’t the primary purpose of the Ladies’ Nine Hole to catch up on the latest scandal rocking the tiny suburb of Woodlawn, Ohio? Just when her life seems to be settling down, Piper finds herself embroiled in a suburban nightmare when her wealthy older husband is mysteriously murdered and she is implicated. Although golfing with the ladies is the hottest game in town, Piper finds her own "hottie" Rusty O’Brien to help soothe her broken heart. When a scandalous affair is revealed and the suspect list begins to grow, romance kicks into overdrive as Piper and Rusty team up to find the murderer before he or she strikes again. Will this match made in the cornfields be able to solve this mystery or has Piper just taken her very last swing? Jennifer Vido first made a splash in the publishing pool with her nationally distributed author interview and book review column called Jen’s Jewels. As a national exercise and aquatics trainer and spokesperson for The Arthritis Foundation, she hosts an annual fundraising author dinner to benefit kids with arthritis. Currently, she lives in the Baltimore area with her husband and two sons. Visit her website at www.jennifervido.com.